Strategically located in the heart of Kyushu, in Kumamoto prefecture lies Aso City. 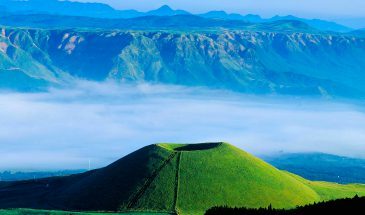 The city itself boasts unique geographic features which include a flat valley and the rugged 5 Peaks of Mount Aso, Japans largest caldera volcano. Unique to the area are fauna such as polemoniaceae and Lily of the valley (Convallaria majalis). Aso’s climate is relatively cool all year round. Its abundant showers and level plains make perfect farming grounds. Its main agricultural production is rice, while vegetables are grown in the mountain highlands. Learn more about Aso here.